ELLIJAY, Ga. – Last weekend saw citizens and volunteers in the community celebrating Earth Day with a Saturday of work and reward across the county. The county reports 169 volunteers spread out across our area to collect trash and roadside debris in an effort to reduce the community blight, but also to improve and maintain the beauty that we have become known for. In recent news stories, the county has seen a large push in the last three months on the issue of roadside trash and in government response to the issue by reinstating inmate work detail picking up the litter. Taking a moment from their day’s work informing people on compost, representatives from the University of Georgia’s exhibit pose for an Earth Day photo in their booth. However, this week citizens stood behind their desires for a cleaner community by stepping out themselves to clean up. Gilmer County Commission Chairman Charlie Paris told FYN the county had collected between 3 and 5 tons of garbage on Saturday through the efforts of those involved. That is not the only garbage collected, though. The week leading up to Earth Day saw the county hosting Amnesty Tire Week. They accepted, free of charge, old tires to be discarded at the county dump. Paris reports the county, through that program, collected 2,702 tires during the weeklong event to go along with the collected trash on Saturday. Additionally, volunteers were treated to a celebration in the county’s parking lot behind Dalton State College, next to the county courthouse. Hosted by Keep Gilmer Beautiful, the day’s clean up and celebration event saw live music, exhibits, and free pizza for those in attendance. 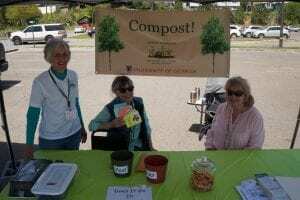 Local exhibitors showcased information and projects for maintaining a clean county, composting, and recycling as well as the Keep Gilmer Beautiful’s Adopt-A-Road Program, the Pleasent Hills Montessori School, Kids Ferst in Gilmer County, and the Girl Scouts. Ellijay Rocks held a rock painting station for citizens to sit under a tent and cool off in the shade as they painted rocks to hide around the community. 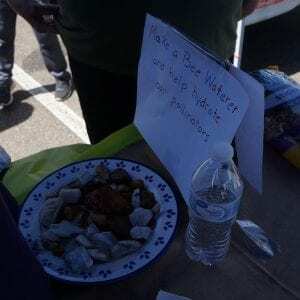 The Mountain Light Unitarian Universalist Chuch hosted a station to teach citizens how to turn old paper into a seed disc they can toss out into the yard to plant seeds. The disc, made from paper, water, and seeds folded together into a slurry, is flattened with a roller or a can to be thrown out into your yard. Without even a need to bury it, rain is held close by the paper slurry helping the seed to get started. Be sure to head over to FYN’s Facebook Page for more photos from Earth Day 2018.